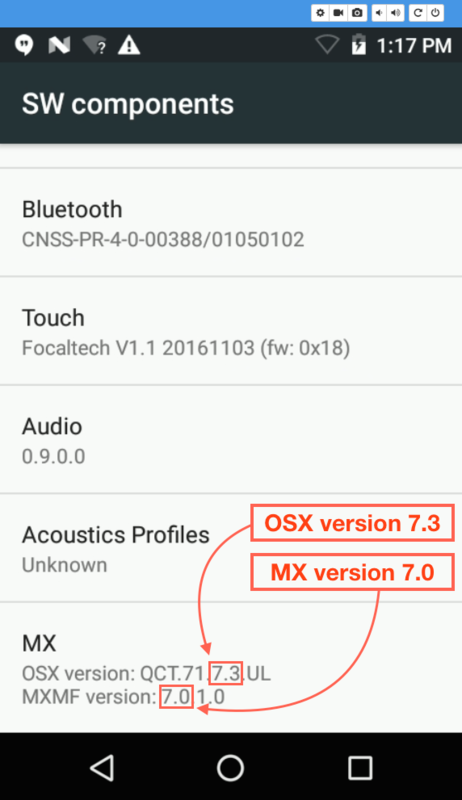 The versions of MX and/or OSX on a device determine whether certain settings and/or features are supported. The Zebra-proprietary OSX layer provides extensions to the base operating system to implement functionality not offered by Android. The root OSX version number always matches the root number of the Android version that it extends. 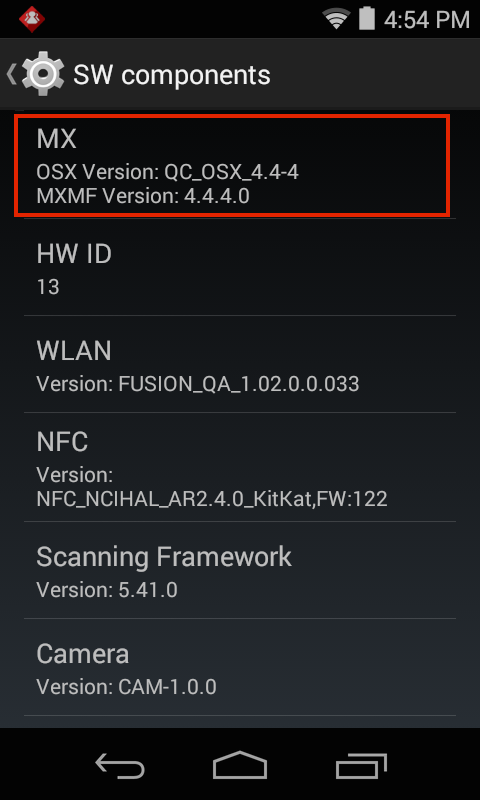 For example, OSX 4.x will always be found on devices running Android 4.x. The same is not always true of MX, which provides a uniform interface into privileged and unprivileged APIs on a variety of Android versions, but does not extend the OS. For some features, the Android version alone is enough to determine a feature set. For others, a specific pairing of MX and Android is required, and still others need a certain combination of MX and OSX. 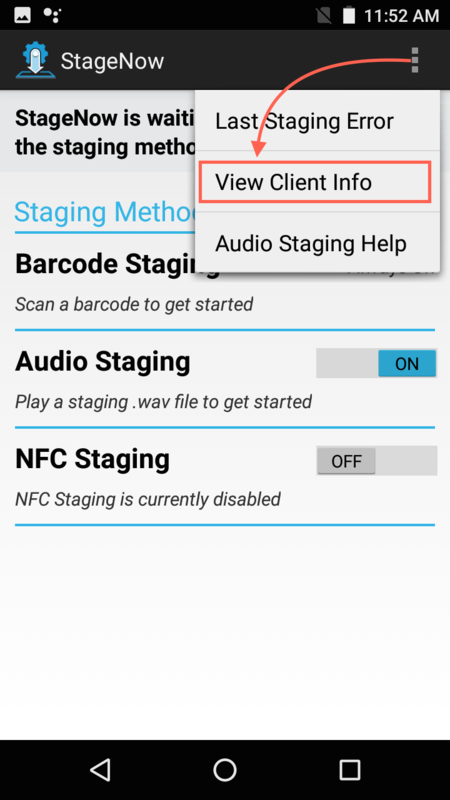 The Settings panel of some devices running Android versions prior to KitKat 4.4 do not display MX and OSX information. To determine the MX and/or OSX version present on such a device, one of the other procedures must be used. 1. In the Settings panel, tap "About Device" (or "About Phone"), then tap SW Components. 2. Locate MX in the list of components. 3. On most pre-L devices, the left-most two numerical digits indicate the major and minor MX and OSX versions. On devices running Android Lollipop and higher, the first number following the letters on in OSX field still indicates the Android version (5=L, 6=M, etc.) but the full OSX major.minor version is indicated by the first two of the four digits at the end of the string. Note: The major OSX version number always matches the major number of the Android version that it extends. 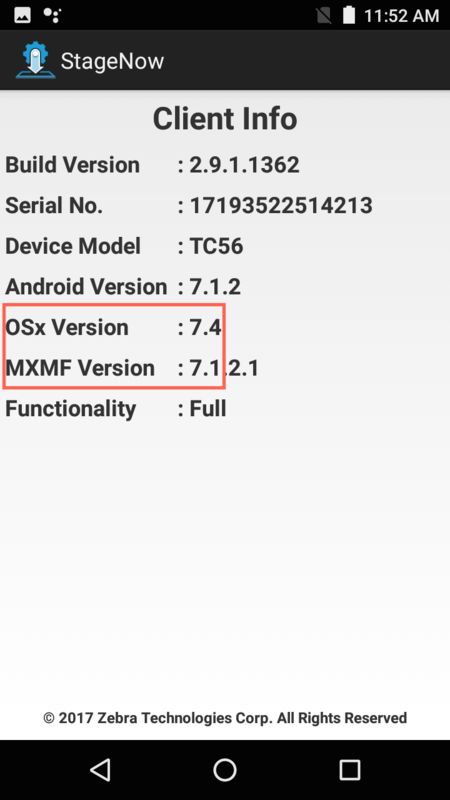 For example, OSX 7.1 through 7.4 all extend Android 7.x. Most devices running KitKat and higher include the StageNow client app, which is used for device configuration and management. The result above shows a device with MX 4.4. The number following the hyphen ("-3") indicates the release number of the latest OS patch applied to the device. The result above shows a device with MX 3.5.